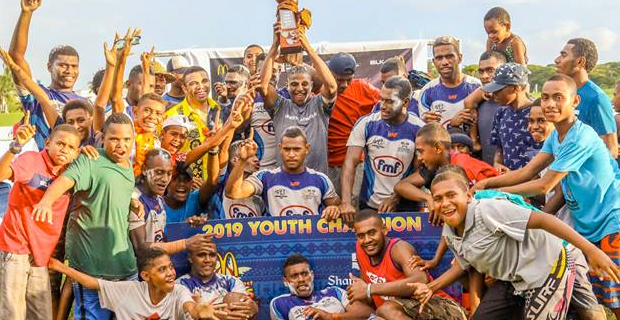 Tuva has retained the McDonalds Coral Coast Youth Competition title for the third year in a row after a 10-0 win over Ratu Filise in the final. Tuva struggled for the win as they tried to maintain the pressure to overcome the unfavorable ground condition. Ratu Filise had a few chances to cross over the line but with tight defensive tactics from Tuva they remained scoreless in the final. KK’s Hardware Saunivalu defeated Rush Academy Wolf Pack 12-7 in the Shield final while Dominion Brothers beat NFA Youth 17-5 in the Bowl final. King 7s Select defeated KISSP Investment Wesley Fijians 17-12 to win the Plate final. The women’s competition continues today with the quarter final starting at 8.40am. Defending women’s Coral Coast champion, Striders has qualified to the quarter finals after defeating Fiji Airports Nadi Blazers 24‑0 in their opening match, the Striders thrashed Marist Seahawks 26‑0 and went on to beat Stars USA Women 29-5 in their last game. Striders will face Fiji Airports Nadi Blazers at 8.40am, Scion will take on Hong Kong Women at 9am, Fijiana Development will battle Stars USA Women in the third quarter final at 9.20am and in the last quarter final Fiji Airports Nadi Aviators will face Marist Seahawks 1 at 9:40am. Meanwhile the men’s competition will also start today and end tomorrow. You can catch the live commentaries of the quarter finals of the men’s competition from 11.20am, semi finals from 2.50pm and final from 5pm tomorrow on our sister station Viti FM 92.2FM, 92FM and 92.6FM.